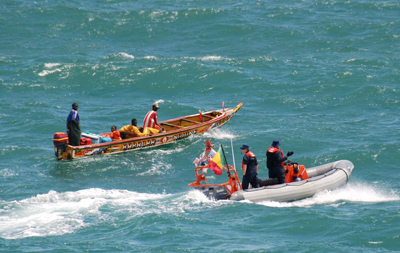 The Spanish Ministry of Interior and the Asociación Pro Derechos Humanos de Andalucía (APDHA) both released reports regarding the numbers of migrants who reached Spain by sea in 2011. 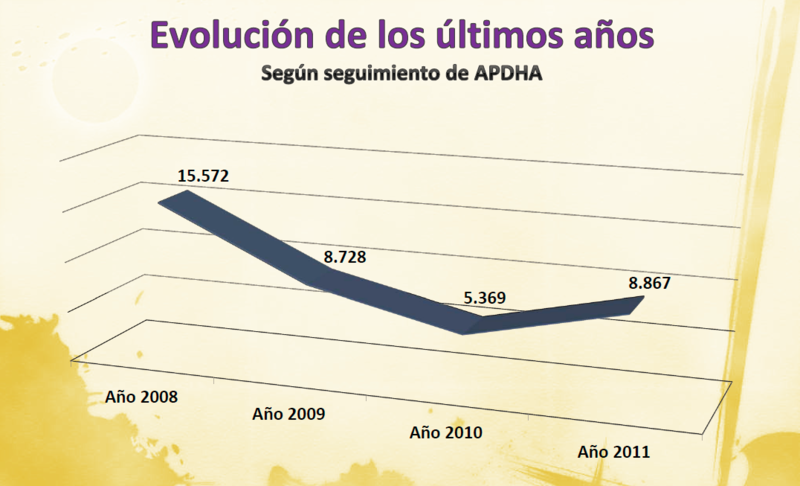 APDHA reports larger numbers of arrivals and deaths in 2011 than the official governmental report. The report from Spanish authorities states that a total of 5,443 migrants were known to have reached Spanish territory by sea, including the Canary Islands, in 2011. 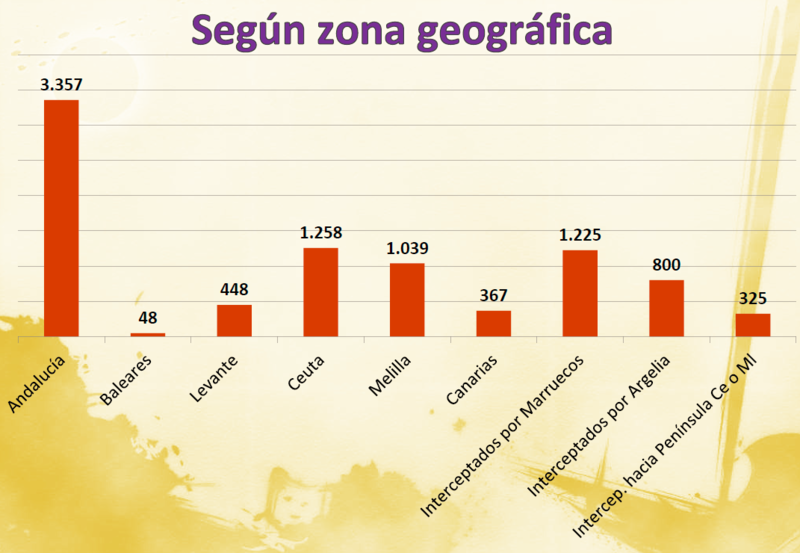 This represents an increase over 2010 when 3,632 persons are known to have arrived, but represents a substantial reduction in total numbers compared to the peak year of 2006 when over 36,000 migrants reached Spain by sea or by entering the North African territories of Ceuta and Melilla. According to Spanish authorities, 340 migrants reached the Canary Islands by sea in 2011, an increase over the 196 who arrived in 2010, but significantly fewer that the over 31,000 migrants who reached the Canary Islands in 2006. 3,345 migrants reached Ceuta and Melilla by sea, by being smuggled into the territories, or by otherwise crossing the border fencing. The Guardia Civil reported that 29 migrants are known to have drowned in 2011, but some NGOs believe the numbers of deaths are much larger. 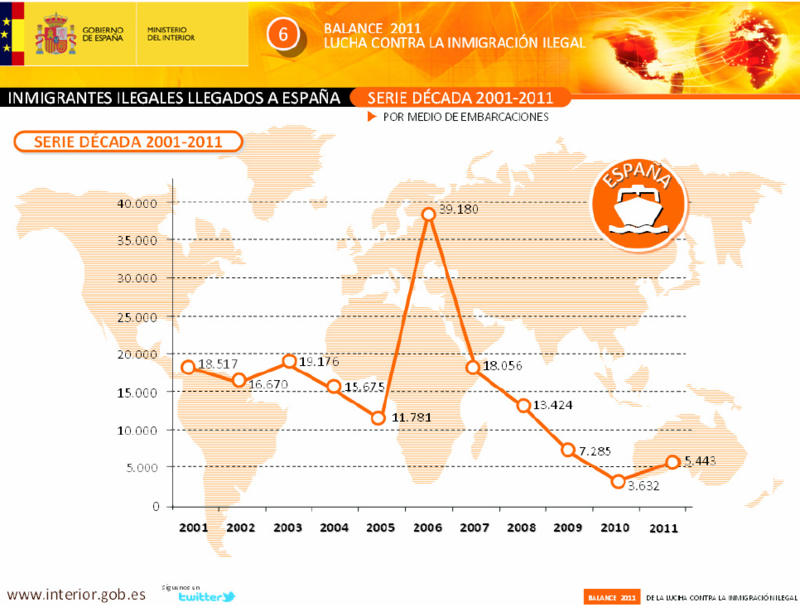 APDHA in its report issued last month stated that it believed a larger number of migrants reached Spain. The APDHA report was based on a survey of publicly available information. It estimates that 8,867 people reached Spain (compared to the 5,443 reported by authorities). 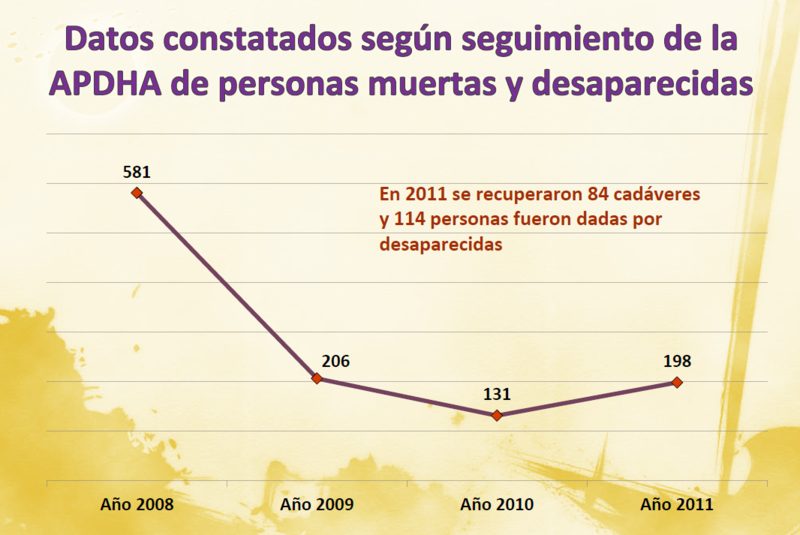 APDHA also reported that 84 migrants are known to have died and at least 114 were known to be missing in 2011. 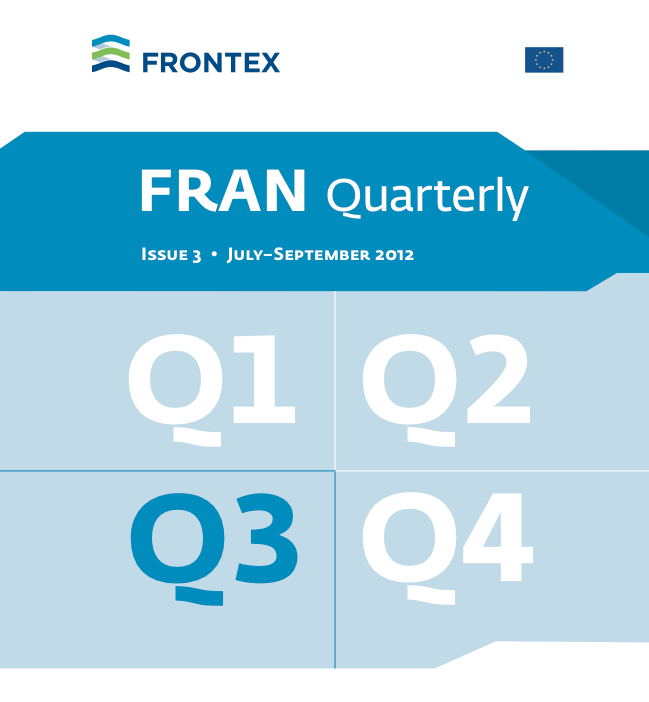 The Frontex Risk Analysis Unit (RAU) released its 2nd Quarter Report (April-June) for 2011 on 4 October. The 1st Quarter Report (Jan-March 2011) was released on 21 July. As always, while the information is a few months old, the reports contain a significant amount of information, graphs, and statistical tables regarding detections of illegal border crossings, irregular migration routes, detections of facilitators, detections of illegal stays, refusals of entry, asylum claims, and more. 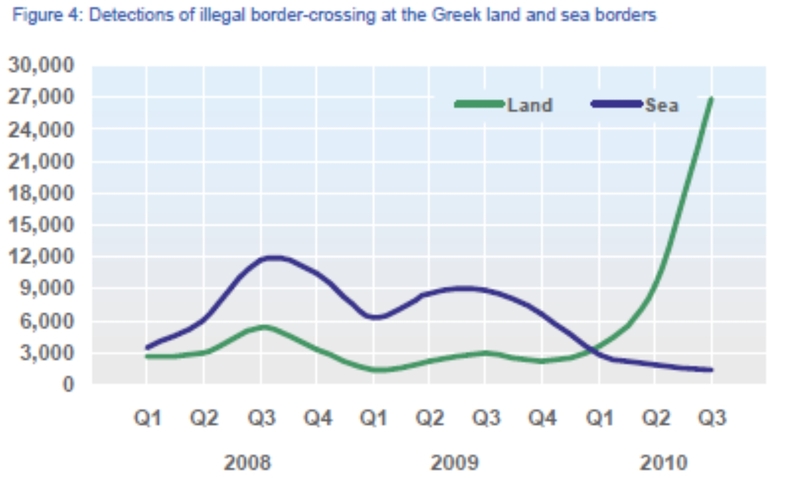 In Q2 2011, all Frontex irregular-migration indicators increased compared to the previous quarter. The most important indicator, detections of illegal border-crossing, increased to a level not seen since Q3 2008 and correspondingly asylum applications are now at nearly the highest level since data collection began. What’s more, migration pressure at the border from migrants attempting to enter and stay in the EU increased even more than EU-level figures suggest, as they are offset against extensive reductions in Albanian circular migration. 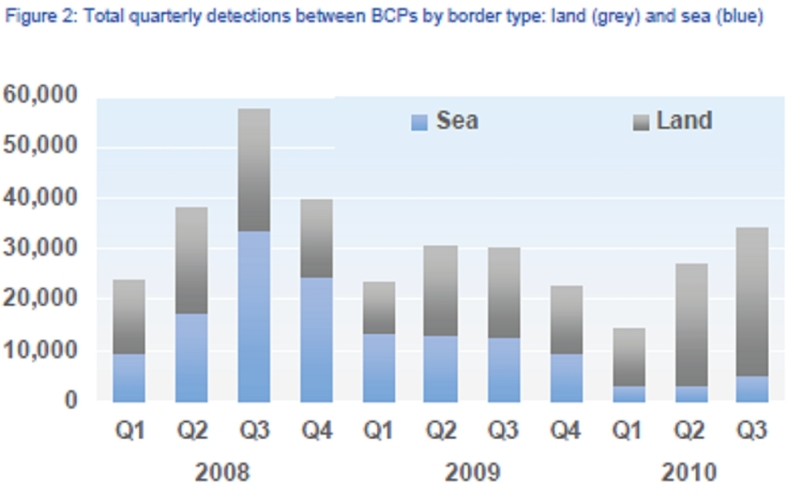 At the EU level, in Q2 2011 there were more detections of illegal border-crossing since Q3 2008. The total of 41 245 detections during this reporting period is a 25% increase compared the previous quarter and a 53% increase compared to the same period last year (Fig. 2). Without question there were major and extensive developments in illegal migration pressure at the external border of the EU, resulting from two simultaneous but independent hotspots of illegal border-crossings. The first was increased activity at the Greek land border with Turkey, where a range of Asian, north African and sub-Saharan African migrants were increasingly detected at very high levels. The second, and the undisputed hotspot for illegal border-crossing into the EU in Q2 2011, was at the Italian islands in the Central Mediterranean, where vast numbers of Tunisians, Nigerians and other sub-Saharan migrants landed in small sea vessels, the majority of which in Q2 had been forcibly departed from Libya. 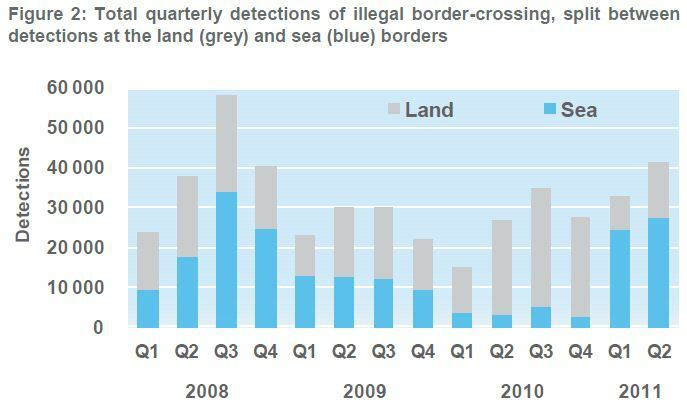 Figure 2 shows the evolution of the FRAN indicator 1A – detections of illegal border-crossing, and the proportion of detections between the land and sea borders of the EU per quarter since the beginning of 2008. 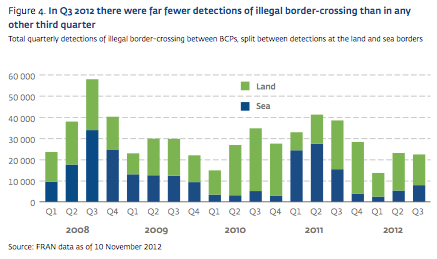 In Q2 2011 there were more detections of illegal border-crossing since the peak of Q3 2008 nearly three years ago. Compared to a year ago, detections at the EU land border decreased by 42% to 13 742 in Q2 2011, almost exclusively due to fewer detections of Albanian nationals following their new visa-free status; elsewhere at the land border (including Greece) trends were roughly stable. In contrast, at the sea border detections increased nine-fold to some 27 500 detections (Fig. 2), the vast majority of which (95%) were in the central Mediterranean, forming the major development in irregular migration to the EU in 2011. 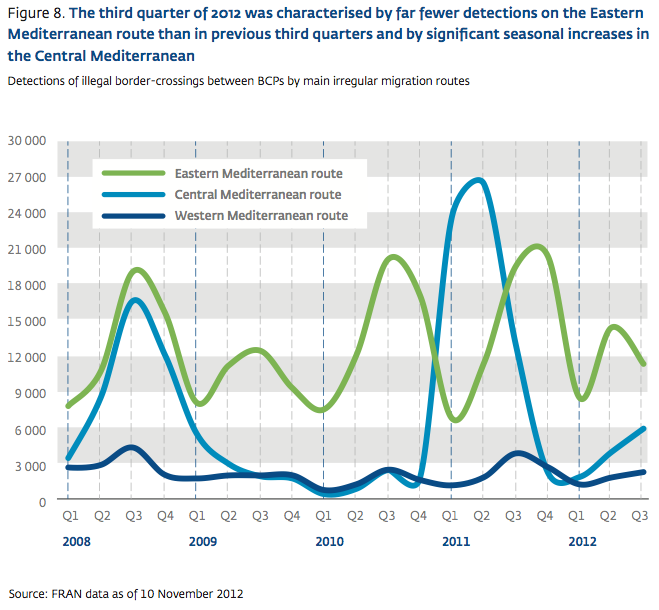 As illustrated in Figure 4, for just the second time since records began in early 2008, in Q2 2011 detections of illegal border-crossings on the Central Mediterranean route, which comprises the blue borders of Italy and Malta, exceeded those reported from both the (i) Eastern Mediterranean route of the land and sea borders of Greece, Bulgaria and Cyprus, and (ii) circular migration from Albania to Greece. Without question, in Q2 2011 the single most important irregular-immigration route in terms of detections of illegal border-crossing was the Central Mediterranean route, where detections increased in the beginning of 2011 to previously unprecedented levels (Fig. 4). In the first quarter of 2011, and uniquely compared to previous surges of illegal immigration, this flow was restricted to a single nationality – Tunisian, most of whom were responding to civil unrest in their home country by leaving towards the Italian Island of Lampedusa. In response to this almost unmanageable influx of irregular migration at a single and isolated location, a bilateral return agreement was signed between Italy and Tunisia, which allowed for the accelerated repatriation of newly arrived individuals. Hence, during the current reporting period, the flow of Tunisian migrants fell from over 20 200 in the previous quarter to 4 300 in Q2 2011. 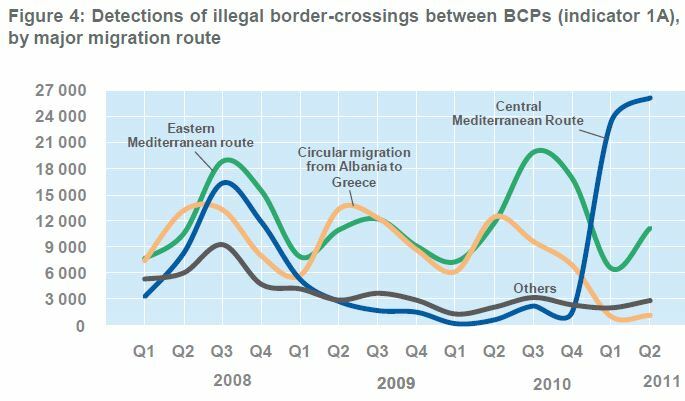 In Q2 2011 there were 26 167 detections of illegal border-crossings on the Central Mediterranean route, a 10% increase even compared to the ‘peak’ reported during the previous quarter, and evidently a massive increase compared to the negligible detections throughout all of 2010. The vast majority of detections on this route were reported from Italy (25 500) where detections increased by 13% even compared to the ‘influx’ of migrants reported during Q1 2011. In Italy, Central African, Tunisian, Nigerian and Ghanaian were the mostly commonly detected nationalities, 90% of which were detected in the Pelagic Islands (14 300), most notably Lampedusa (Fig. 7). However, in Q2 2011 there were also more detections of illegal border-crossing reported from Sicily (2 260) than ever before; this figure is nearly three times bigger than that reported in the previous quarter and more than twenty times higher than during the same period last year (100). Compared to the previous quarter, in Sicily there were more detections of migrants from a very wide range of countries such as Egypt, Côte d’Ivoire and Tunisia. There were also over 710 detections reported from Malta, which is a sustained peak from the previous quarter (820) and extremely high compared to the negligible detections throughout 2010. In Malta there were much fewer detections of Somalis and Eritreans but there were increased detections of Nigerians and migrants from Côte d’Ivoire. 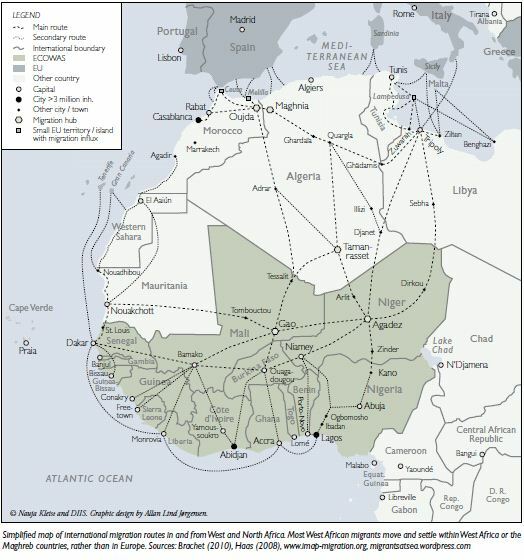 However, migrants from Tunisia, Algeria and Egypt often claim to originate from sub-Saharan Africa in an attempt to appear as refugees, a fact which may render such comparisons of nationalities somewhat misleading. In the previous FRAN Quarterly (Q1 2011) it was reported a surge of irregular immigration (20 000 detections) on the Central Mediterranean route that was almost entirely restricted to a single nationality: Tunisian (Fig. 8). As a result of this influx, on 20 February the JO EPN-Hermes Extension 2011 commenced in the central Mediterranean, and a bilateral agreement was reached between Italy and Tunisia on 5 April 2011, which resulted in the strengthening of police surveillance along the Tunisian coast and regular repatriations of Tunisian nationals from Italy. For example, according to data collected under JO Hermes 2011, some 1 696 Tunisians were repatriated between 5 April and 23 August 2011. The repatriation agreement is probably an effective deterrent, combining as it does, returns and surveillance, however some migrants have reported their boats being spotted by military patrols that did not take any action. According to the FRAN data, in Q2 2011 some 4 286 Tunisian migrants were still detected illegally crossing the border into Italy. Although a massive reduction, this still represents a very large and significant flow of irregular migrants into the EU. Click here for 2011 Q2 Report. Click here for Frontex Statement regarding 2011 Q2 Report. Click here for 2011 Q1 Report. Click here for Frontex Statement regarding 2011 Q1 Report. From Europa Press: Juan Martinez, Chief Inspector of the Spanish National Police’s Illegal Immigration Network and False Document Unit (UCRIF – Unidad Contra las Redes de Inmigración Ilegal y Falsedades Documentales), attributes the significant decline in the arrival of migrant boats in the Canary Islands to the deployment of Frontex, diplomatic management in the countries of origin, and repatriation policies. 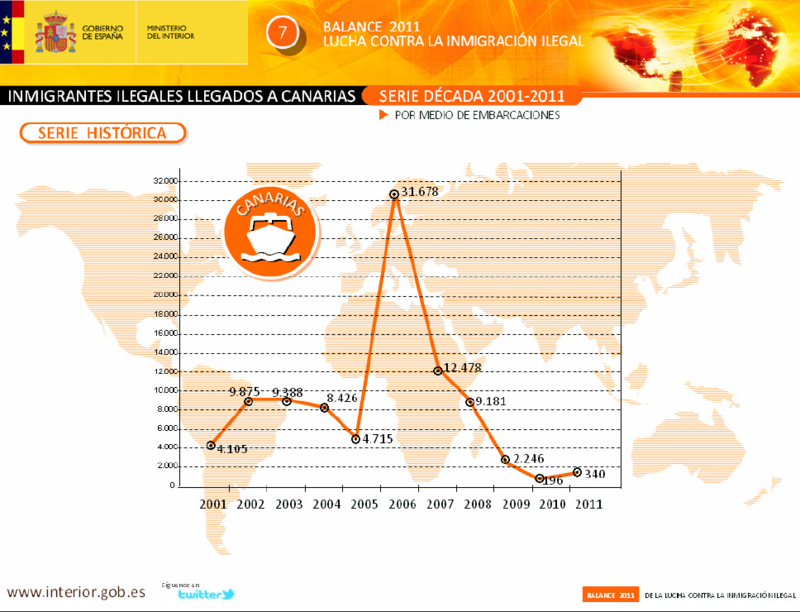 The article notes the first migrant boat arrival in the Canaries in 1994, the peak years of 2006-2008, and the ensuing practices which have halted further migrant arrivals. Click here (ES) for article. Click here (ES) or here (ES) for full report. Click here (ES) for news article.